Identify a limiting reagent from a set of reactants. Calculate how much product will be produced from the limiting reagent. Calculate how much reactant(s) remains when the reaction is complete. One additional assumption we have made about chemical reactions—in addition to the assumption that reactions proceed all the way to completion—is that all the reactants are present in the proper quantities to react to products. This is not always the case. Consider Figure 5.2 “Making Water”. 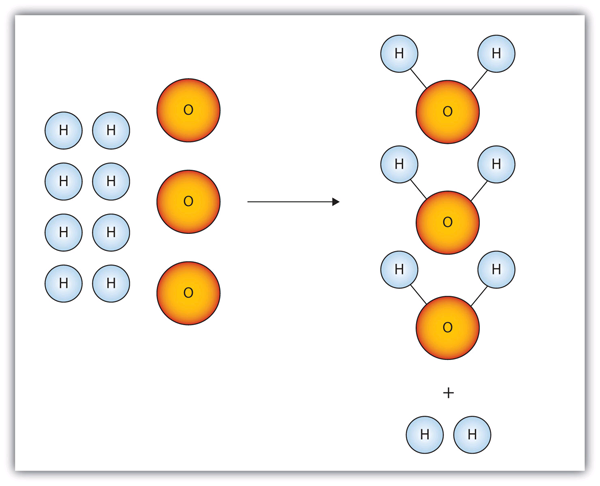 Here we are taking hydrogen atoms and oxygen atoms (left) to make water molecules (right). However, there are not enough oxygen atoms to use up all the hydrogen atoms. We run out of oxygen atoms and cannot make any more water molecules, so the process stops when we run out of oxygen atoms. In this scenario for making water molecules, we run out of O atoms before we use up all the H atoms. Similar situations exist for many chemical reactions when one reactant runs out before the other. A similar situation exists for many chemical reactions: you usually run out of one reactant before all of the other reactant has reacted. The reactant you run out of is called the limiting reagent; the other reactant or reactants are considered to be in excess. A crucial skill in evaluating the conditions of a chemical process is to determine which reactant is the limiting reagent and which is in excess. The key to recognizing which reactant is the limiting reagent is based on a mole-mass or mass-mass calculation: whichever reactant gives the lesser amount of product is the limiting reagent. What we need to do is determine an amount of one product (either moles or mass) assuming all of each reactant reacts. Whichever reactant gives the least amount of that particular product is the limiting reagent. It does not matter which product we use, as long as we use the same one each time. It does not matter whether we determine the number of moles or grams of that product; however, we will see shortly that knowing the final mass of product can be useful. Suppose we start a reaction with 50.0 g of As and 50.0 g of O2. Which one is the limiting reagent? We need to perform two mole-mass calculations, each assuming that each reactant reacts completely. Then we compare the amount of the product produced by each and determine which is less. You must remember to perform this final subtraction to determine the amount remaining; a common error is to report the 16.0 g as the amount remaining. What mass of Mg is formed, and what mass of what reactant is left over? Because the question asks what mass of magnesium is formed, we can perform two mass-mass calculations and determine which amount is less. The 0.711 g of Mg is the lesser quantity, so the associated reactant—5.00 g of Rb—is the limiting reagent. To determine how much of the other reactant is left, we have to do one more mass-mass calculation to determine what mass of MgCl2 reacted with the 5.00 g of Rb and then subtract the amount reacted from the original amount. Given the initial amounts listed, what is the limiting reagent, and what is the mass of the leftover reagent? H2S is the limiting reagent; 1.5 g of MgO are left over. The limiting reagent is that reactant that produces the least amount of product. Mass-mass calculations can determine how much product is produced and how much of the other reactants remain. 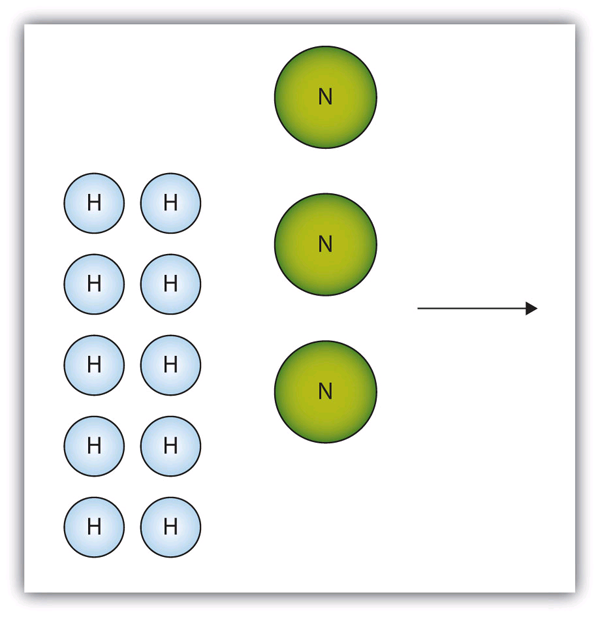 The box below shows a group of nitrogen and hydrogen molecules that will react to produce ammonia, NH3. What is the limiting reagent? The box below shows a group of hydrogen and oxygen molecules that will react to produce water, H2O. What is the limiting reagent? Given the statement “20.0 g of methane is burned in excess oxygen,” is it obvious which reactant is the limiting reagent? Given the statement “the metal is heated in the presence of excess hydrogen,” is it obvious which substance is the limiting reagent despite not specifying any quantity of reactant? Acetylene (C2H2) is formed by reacting 7.08 g of C and 4.92 g of H2. 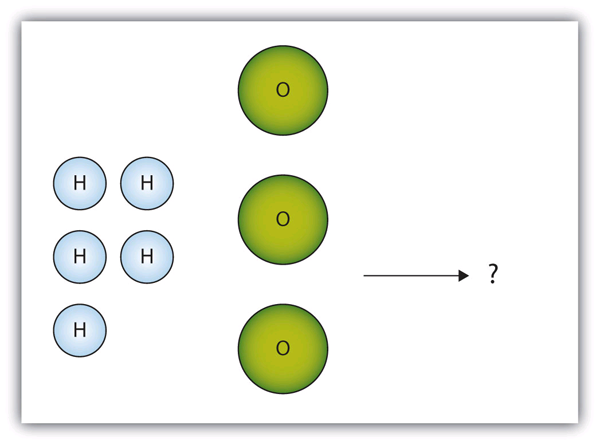 What is the limiting reagent? How much of the other reactant is in excess? Ethane (C2H6) is formed by reacting 7.08 g of C and 4.92 g of H2. Given the initial amounts listed, what is the limiting reagent, and how much of the other reactant is in excess? To form the precipitate PbCl2, 2.88 g of NaCl and 7.21 g of Pb(NO3)2 are mixed in solution. How much precipitate is formed? How much of which reactant is in excess? In a neutralization reaction, 18.06 g of KOH are reacted with 13.43 g of HNO3. What mass of H2O is produced, and what mass of which reactant is in excess? Nitrogen is the limiting reagent. Yes; methane is the limiting reagent. C is the limiting reagent; 4.33 g of H2 are left over. H2O is the limiting reagent; 25.9 g of P4O6 are left over. 6.06 g of PbCl2 are formed; 0.33 g of NaCl is left over. Limiting Reagents by Jessie A. Key is licensed under a Creative Commons Attribution-NonCommercial-ShareAlike 4.0 International License, except where otherwise noted.